Take A Hike – Connecting With The Outdoors at Maine Camps! Did you know this Saturday (November 17, 2018) is National Take a Hike Day? This is a holiday to encourage people to take advantage of the incredible hiking trails offered in America, and connect with nature. Of course, if you’re a camper at a Maine Camp Experience (MCE) camp, you don’t need a holiday to explore the great outdoors! MCE campers have ample opportunities to get outside and hike through our camps’ incredible tripping programs, and get unique opportunities to connect with nature throughout their camp summers. MCE camps’ tripping programs allow kids to connect with nature in a variety of ways. 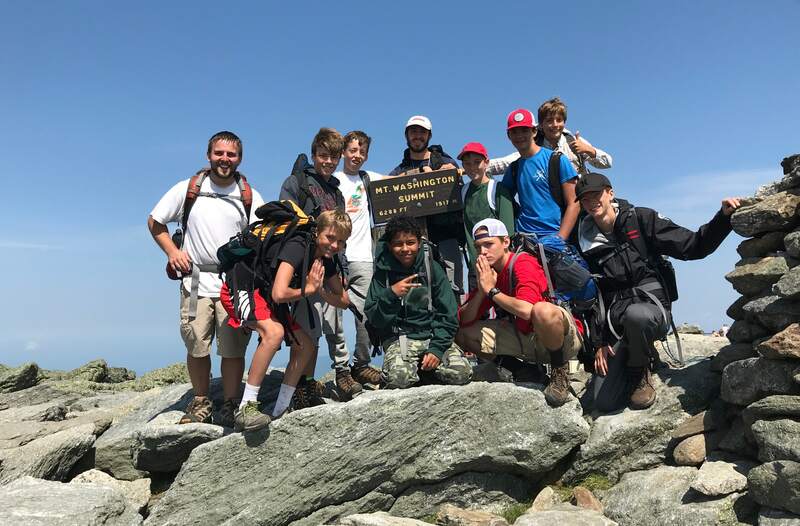 From simple nature strolls along nearby streams, to summiting some of the tallest peaks in New England like Mount Katahdin and Mount Washington – our kids really do it all. In fact, there are some unique tripping opportunities at MCE camps where campers will spend several weeks adventuring outside camp – they’ll cook, camp, hike, bike, and more as they appreciate everything Maine and New England has to offer. In addition to these scheduled hikes, many camps have dedicated campcraft and outdoor living programs, and participating campers will learn important outdoor skills like how to build a fire, pitch a tent, and use a compass. So why do MCE camps make such an effort to introduce campers to hiking opportunities? There are countless benefits to getting outside and hiking. First of all, hiking is a great way to spend time with friends and family. Though most days at camp are already phone-free, there’s something about a hike that really helps foster human connections. From simply joking around to singing songs and playing games, hiking up a mountain really brings people together, and I’ve found that many campers return from their hikes with a new arsenal of jokes and “had to be there” stories of the trip. And of course, taking a hike is a great way to connect with nature. For those of us who see more pavement than grass on a day to day basis, it can be truly awe-inspiring to remember what it’s like to be surrounded by beautiful trees and woodland, and to appreciate just how beautiful the natural environment is. In fact, some studies even show that immersing oneself in nature can reduce stress and boost one’s mood – and this New York Times article highlights the many health benefits of “Forest Bathing”. One other great benefit to hiking is that it is a great way to build resilience and self-confidence, and to teach the benefits of hard work and patience. Oftentimes the best hikes can be the most challenging – it takes effort and determination to keep putting one foot in front of the other. Your legs get tired, the slope gets steeper, and the summit seems perpetually in the distance. But when you get to the top, the sense of accomplishment – and the view – make the whole journey worthwhile. So strap those boots on and pretend it’s another camp day in Maine – this Saturday, celebrate and take a hike!